The choking air of summer hit me as soon as I opened my car door. The air conditioned ride from the Westside to the San Fernando Valley left me unprepared for the heat assault.I needed a cold beverage and a plate of tacos. The taco hut wasn't my destination, just a stop on my way to visit friends in Van Nuys. In some ways I think I make friends with people in different parts of LA just so I can eat tacos in their city when I visit them. Before this blog I would make excuses for reasons not to hang out with people. 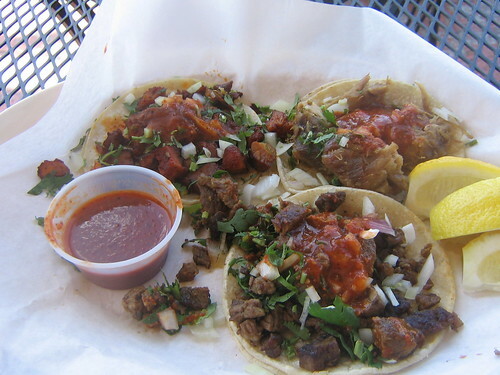 Now I find myself mapquesting taquerias in their neighborhoods(I really need a friend in Highland Park). 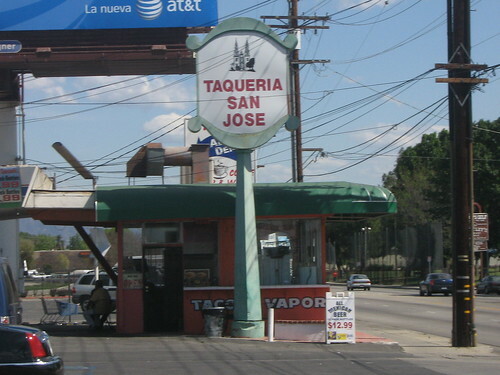 Taqueria San Jose is a small taco shack a block east of Hayvenhurst on Vanowen in Van Nuys.They advertise tacos al vapor which are typically tacos de lengua or cabeza that are pressure cooked but i was in the mood for the taco trifecta so I went with al pastor, carnitas and asada. The tacos came topped with onions, cilantro and a chile salsa. The carnitas, crisp at the edges had that perfect salty porkyness that goes so well with a squirt of lemon(or lime) and a spicy chile salsa. Both the pastor and asada had that grill taste and went well with an ice cold mexican coke. I could have gone another round but the tacos al vapor will have to wait til next time. I wasn't in the mood for tongue. A great find! Carnitas were fabulous and the al pastor was terrific! We're going back tomorrow for the carne asada. Ah, Bandini! You've done it again.